Have you ever found yourself shopping for clothes online, adding styles you love to your ‘shopping cart’, but then leaving them in the cart because you were unsure how they would look or fit? If you are like many women, the idea of shopping online is daunting. Many concerns arise: “Will it look great?” “If only the sleeve could be a bit longer to cover my arms, or the hem a little bit shorter to show off my legs.” The desire to look distinctive and feel gorgeous, while confident and empowered when shopping for new clothes is something we all share – but is not always fulfilled. That is where eShakti comes in. A completely unique online fashion business that not only offers great retro-modern and trendy styles of dresses, skirts, tops, sweaters and jackets in standard sizes, eShakti also empowers women by allowing them to modify original fashions to suit their personal style and fit requirements, ensuring a look that is completely their own. Alter a neckline, shorten the length or change a sleeve style; the options are endless. eShakti allows women to customize their own looks by bringing off the rack and made-to-measure clothing to women of all shapes and sizes, from petite to plus size (size 0-36W) for the best fit available online. A company committed to high quality with terrific affordability, all products range from $39.95 – $129. 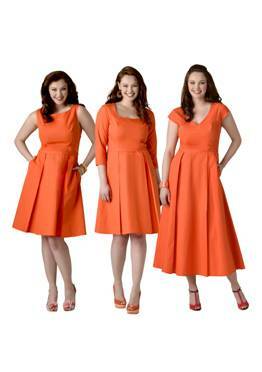 In addition, eShakti continues to increase product availability. New products and styles are introduced on a daily basis that keeps it fashion forward and trendy at all times, including the launch of a specialized bridal and special events dress collection featuring over 20 versatile designs and quality fabrics, all maintaining the brand’s commitment to affordability. Unlike traditionally tailored clothing, eShakti’s quick turnaround time allows shoppers to receive their custom-made look within two weeks of ordering. In addition, the website removes the wide range of hassles that often accompany online shopping. Whether sizing frustrations, product availability issues, or simply a lack of time, eShakti offers a solution, making it some customers’ only fashion destination for uniquely designed clothing with remarkable turnaround and no-questions-asked returns. eShakti is a trendy women’s online fashion retailer that offers something unique – customizable women’s clothing that can be easily personalized by size (0-36W), measurement and style. Offering distinctive designs, quality fabrics, unique details and dressmaker finishes, the brand empowers women to get clothes that best suit their personal size and style, all at an affordable price. The brand delivers unparalleled fit via easy online measurement tools. Custom styling capabilities allow shoppers to tailor any item to their specific tastes, whether it’s a hemline, neckline or sleeve length, to ensure a flattering fit and custom-made look. 5W Public Relations (5W) is a full-service agency known for cutting edge programs that engage people with businesses, issues and ideas. With more than 90 professionals serving clients in B2C (Beauty & Fashion, Consumer Brands, Entertainment, Food & Beverage, Health & Wellness, Travel & Hospitality, Technology, Nonprofit), B2B (Corporate Communications, Reputation Management, CSR, Sustainability Communications), Public Affairs, Crisis Communications and digital strategy, 5W brings leading businesses a resourceful, bold and results driven approach to communications. This entry was posted in Clothing, Fashion, Shopping, Womens Fashion and tagged custom, customize, e-tailer, eShakti, fashion, retailer, Shopping. Bookmark the permalink.